I have shared one or two other poems here. Material like this brings me back into focus. I hope you feel the same way. I also have a hunch that, with its punchy slam poetic lines and graceful visuals, hidden woods might resonate with younger viewers. I showed it to my teenage daughter and she agreed. So here is an invitation: think of a child or teenager you know, get them to watch the video, and ask them what they thought of it. I would be be very grateful to hear of any interesting responses here. Thanks to my friend Angela le Peuple, and to Carole at Sparks childcare co-operative in Bristol, for bringing the video to my notice. 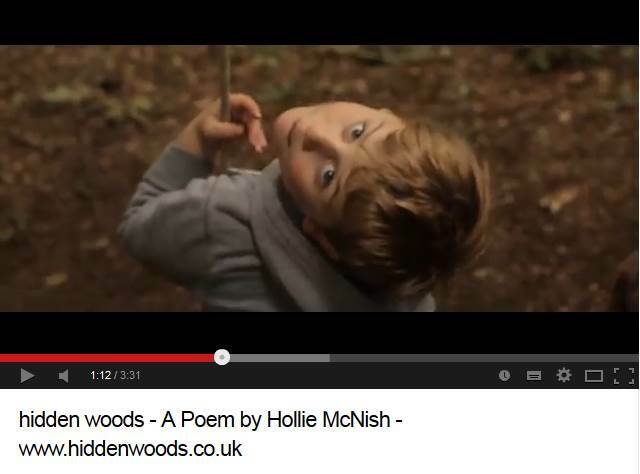 This entry was posted in Nature, Outdoor play and tagged childhood, Hollie McNish, nature, poem, poetry, video, woodland. Bookmark the permalink. Well done Hollie McNish again for such beautiful words that bring tears to my eyes. And lovely film too. Hi Tim, thanks for this, love hollie’s rhythm and rhyme. Can we out this on the FSA front page? Jon – sure thing – and any time. People seem to think I’m mad when I talk about the restorative power of a walk in the woods. They just kind glaze over. I’ll try showing them this video as well now. Hollie McNish was brilliant last week. Can’t wait to see her again. A great video to watch during Love Outdoor Play week.